Frigel's scientific approach to process cooling included a detailed assessment of CH3 Solutions' processes and unique molds, paying attention to the method used to produce floor tiles. The cooling-system supplier also considered the molder's rapid growth. From there, it custom-designed and installed a system offering: • Better central cooling: An Ecodry 3DK closed-loop adiabatic central cooler efficiently and cost-effectively delivers clean cooling water to machine-side units at each production cell. The Ecodry unit reuses water, which drastically reduces water consumption com- pared with an open-cooling tower. It also allows free cooling during cooler months of the year, saving energy. • Precise machine-side temperature control: Seven Microgel Chiller/ TCUs and one Turbogel TCU provide the required temperature, pressure and turbulent flow to each individual process and mold. In all, CH3 Solutions operates eight production cells. • Control system with remote monitoring service: When needed, Frigel's technical experts can remotely assist with cooling chal- lenging molds and manage a wide array of system parameters to ensure peak performance. The modular Ecodry central cooler features a single set of pipes and a bolt-on pumping system, allowing for easy system expan- sion. In addition, CH3 Solutions can add compact, mobile Microgel units to new production cells as production capacity expands. CH3 Solutions' thorough analyses of process-cooling systems paid off. The Frigel Intelligent Process Cooling system quickly demonstrated the ability to help the company achieve production and business goals with less water use, lower energy consump- tion, reduced chemicals use and costs, faster mold changeovers, and less need for routine maintenance. The system also provided the molder with a way to overcome the challenge of consistently producing high-quality floor tiles in large volumes, further enhancing its reputation as an industry leader. Says Rodney Davenport, CH3 Solutions v.p., "As a technology- driven company, we wanted more out of process cooling. We also strive to eliminate waste in every aspect of our business. We chose Frigel for process cooling. For us, it's been awesome, and we plan to be partners with Frigel for years to come." C H 3 S O L U T I O N S — DA LTO N , G A . 'Intelligent' Cooling Helps Molder Improve Productivity, Profitability & Quality Cost-effective and user-friendly process-cooling system gives custom molder the ability to do more with less. Founded in 2015, CH3 Solutions is a "proven startup," committed to the "pursuit of doing things better" in all aspects of its business. When relocating in 2016 to a 90,000 ft² facility in Dalton, Ga., to accommodate rapid growth, the custom injection molder (ch3solutions.com) decided to implement a better approach to process cooling. It had three main goals: 1. Gain control over cooling-water temperatures and flow rates when producing millions of high-quality floor tiles per year. Traditional process cooling made it difficult to produce smooth, flat tiles with consistent coloration. 2. 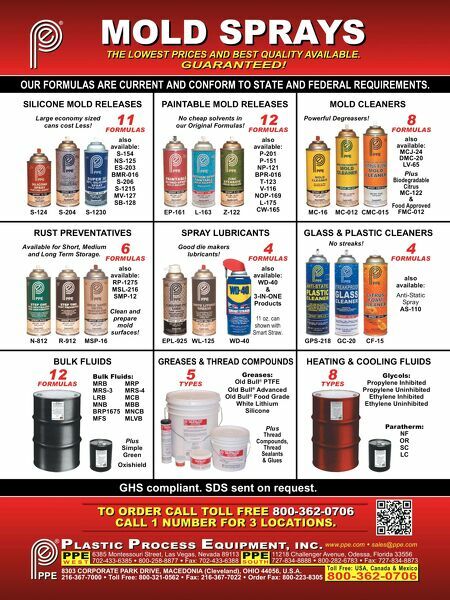 Maximize operational efficiencies and improve profit margins, dictating reduc- tions in energy, maintenance and chemical- treatment costs. 3. Minimize water waste, improving its ecological footprint. As a small business, CH3 Solutions required a cost-effective and user- friendly pro- cess-cooling system that would allow it to do more with less. The cooling system also needed to run with maximum uptime to ensure peak produc- tivity and ongoing customer satisfaction. After reviewing options and cost-benefit analyses, CH3 Solutions chose to implement the Intelligent Process Cooling system from Frigel North America, E. Dundee, Ill. (frigel.com). 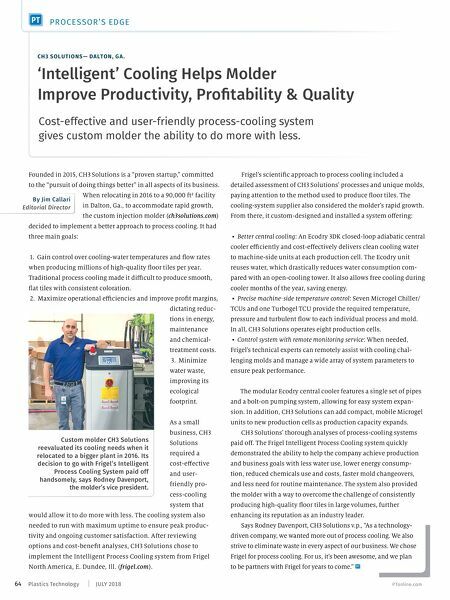 By Jim Callari Editorial Director 64 JULY 2018 Plastics Technology PTonline.com PRO CE S S OR 'S ED G E Custom molder CH3 Solutions reevaluated its cooling needs when it relocated to a bigger plant in 2016. Its decision to go with Frigel's Intelligent Process Cooling System paid off handsomely, says Rodney Davenport, the molder's vice president.